These No Bake Ferrero Rocher Coconut Cheesecake Jars are easy and quick to prepare… they have layers made up of coconut cheesecake, Hazelnut Nutella Ganache, and Graham cracker crumbs. A treat to die for! Spring has been signaling its arrival, and Easter is coming up in about a month or so. 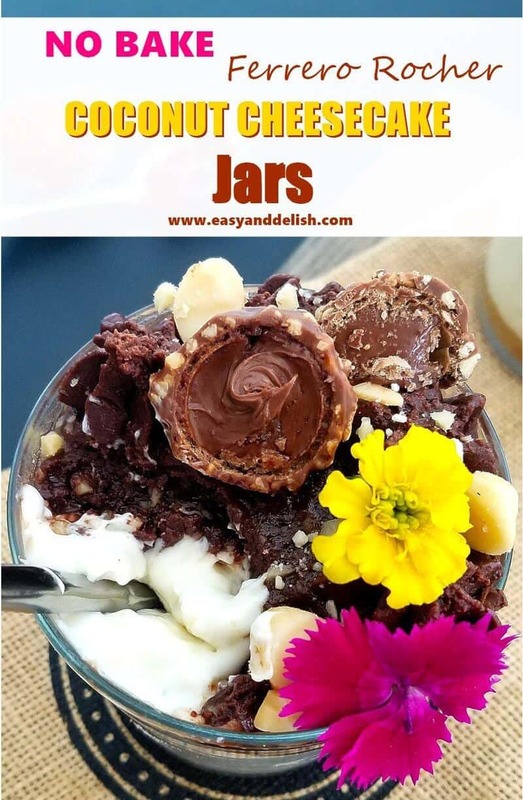 These easy, quick, and scrumptious No Bake Ferrero Rocher Coconut Cheesecake Jars are individual treats perfect for celebrating the occasion, as well as the entire Spring season. To prepare our Ferrero Rocher Coconut Cheesecake Jars, all we need to do is mix together Graham cracker crumbs with melted unsalted butter and coconut extract, and place into jars. 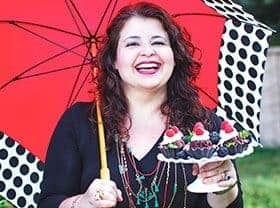 Then, beat softened cream cheese with sugar until creamy and stir in canned coconut milk, coconut extract, and coconut flakes… layering on top of the cookie layer. Next, mix melted chocolate chips and butter with Nutella, heavy cream, and chopped hazelnuts. Spoon over the coconut cheesecake layer and refrigerate until set. Just right before serving, garnish with Ferrero Rocher bonbons and devour this happy treat. I am tellin’ ya! They are so simple to prepare that even those who have no cooking skills can proudly make these in the blink of an eye. Not only are they great for your Easter table, but also for giving away as Easter presents! If you are a chocolate lover like me, check out our two other Easter chocolate treats: Easter Chocolate Braid and Easter Rabbit Hole Cookies. In addition, do you observe Lent? If so, you gotta try some of our favorite dishes made with seafood, such as our One Pot Brazilian Shrimp Stew and 10-Minute One Pan Seafood in Pesto Sauce . They really make great main dishes for your Easter table. Keeping everything simple yet delish can save you time and energy to enjoy the celebration with your family and friends. 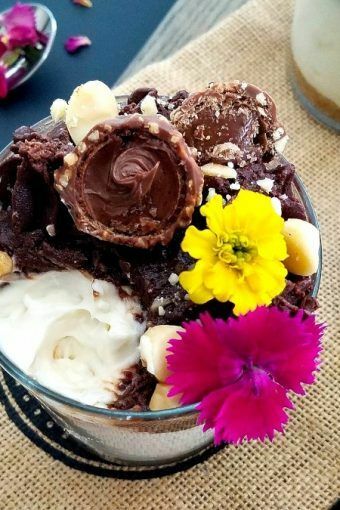 I hope that you try our addictive Ferrero Rocher Coconut Cheesecake Jars… and enjoy the flowery season outdoors. Here in Texas, it is simply the best time of the year for taking family pictures amid the bluebonnets. These No Bake Ferrero Rocher Coconut Cheesecake Jars are easy and quick to prepare... they have a layer of coconut cheesecake, Hazelnut Nutella Ganache, and Graham cracker crumbs. A treat to die for! Prepare the Graham cracker crumb layer by mixing Graham cracker crumbs, melted butter, and coconut extract together in a small bowl. Spoon about 3 Tablespoons of the mixture into each of the 4 jars and gently pack down in the bottom of each jar. 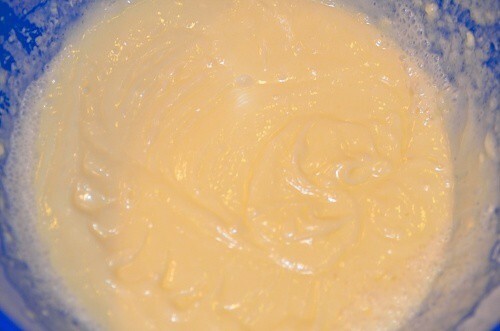 Then, beat cream cheese and sugar together in the bowl of a mixer until creamy. Add the coconut milk, extract, and flakes, stirring well until homogeneous. Divide among the jars, spooning over the cookie crumb layer and gently leveling with the back of a spoon. Finally, place chocolate chips, heavy cream, and butter into a medium microwave-safe bowl and microwave in 30-second intervals, stirring between each interval, until chocolate is completed melted. Stir in Nutella and chopped hazelnuts. Spoon mixture on top of the cheesecake layer, reserving about a cup to pipe on top if desired. I used a large star pipe. Cover jars and refrigerate until set (about 1 hour or more). Right before serving, garnish with Ferrero Rocher bonbons and hazelnuts if desired. Enjoy! 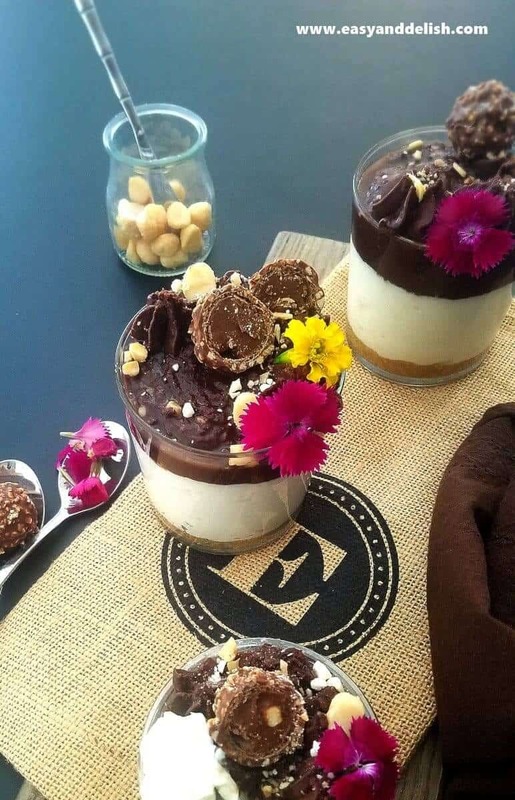 These Ferrero Rocher Coconut Cheesecake Jars feature mild (Graham cracker), slightly sweet (coconut cheesecake), and bittersweet/mildly salty (ganache) layers. The overall effect is rich yet well-balanced. A real hit for children and adults! Spring is coming then I’m longing to summer. I love the way you decorate the jars, it reminds me of summer really!! This recipe is really niceeee! Almost like chocolate cheesecake, but better! No baking and Ferraro Rocher, sublime! No bake? Sold! Lovely looking dish — loaded with flavor. And no bake! Can’t get better than that. Thanks!